I have learned so much in the past two and a half weeks and become so accustomed to trail life that it feels like I have been out her for years! I have found that the learning curve is steep, so don’t let any mishaps that occur in the first few days or weeks discourage you from continuing on (or starting) your journey. Here is some of what I have learned so far. I have completed the state of Georgia! 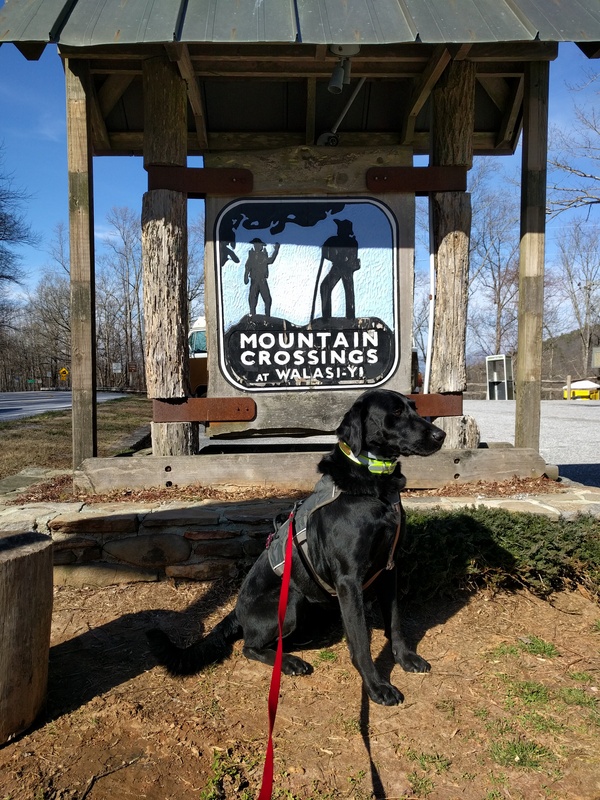 I hiked my first 100 miles on the trail! I have now hiked further than I ever had in a continuous trip. 166 miles down! I have now hiked for more days than I ever had in a continuous trip. 19 days down! You will hear whisperings of how tough a climb Blood Mountain is. Sure it is no piece of cake, but look out because there are much harder climbs ahead. North Carolina welcomes you with two short but steep climbs that will make you miss the switchbacks of Georgia. Still though this section has nothing on Jacobs Ladder a unforgiving section of straight up climb about 2 days out of Nantahala Outdoor Center. I can only imagine these baby climbs are preparing me for the rock scrambles of the North. If you are making a dish such as a Knorr pasta side that calls for milk, do NOT boil reconstituted powdered milk. You have been warned. It will boil right out of your pot like a science project volcano and leave a thick film of burnt milk on the bottom of your pan. Try adding the powder to hot water after it is boiled, or better yet just skip the milk and use water. All this walking has done a number on everyone’s joints. I was luckier than most to make it to week 2 without serious pain but just before NOC my knee started hurting. Not the usual sore muscled or blister kind of hurt but the popping, pinching, something-ain’t-right kind of hurt. I got a compression brace at NOC for extra support and that helps some along with a good bit of ibuprofen. Take it easy on yourself in the beginning. Everyone is telling you this for a reason! 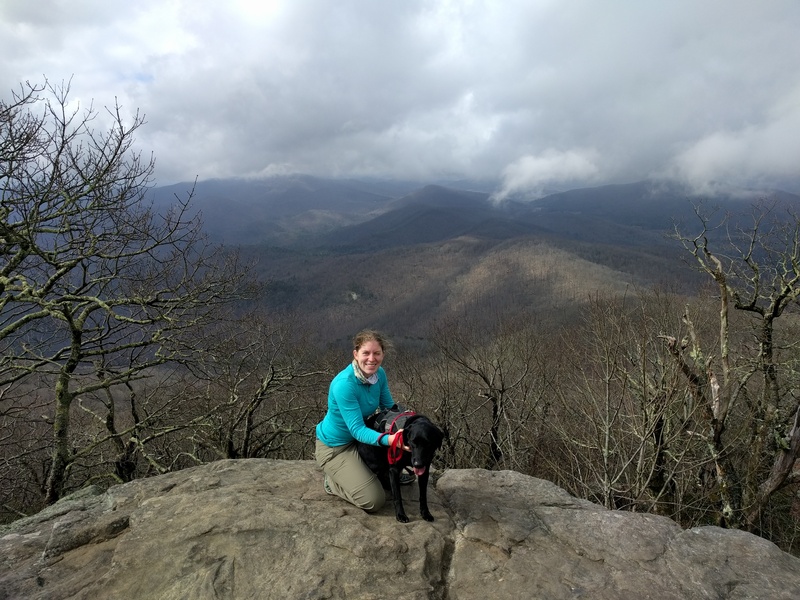 Climb the Wesser bald fire tower. You won’t regret it! After resting up the last several days my knee is still giving me some trouble but I’m antsy to get back to hiking north. I picked up a pair of Black Diamond trekking poles at REI and I am excited to learn to use them and hopefully relieve some of the stress on my joints. 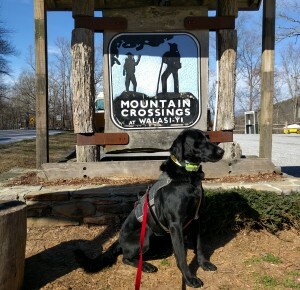 I will be starting where I left off at the boundary to the Smokey Mountain National Park, where dogs are not allowed, so Jetta will continue to rest up at home with my husband. She will join me again after this section of trail and I know she will be overjoyed to be on the trail again. Having grown up in East Tennessee I was lucky enough to spend time in the SMNP as a kid and I’m looking forward to being in familiar territory. My excitement is somewhat dampened though by the fear of catching norovirus, a stomach bug, which has popped up along the trail concentrated around the SMNP. If you plan on traveling in or around the Smokey Mountain National Park any time soon be sure to wash your hands frequently with soap and water, avoid sharing food and drinks, and burry waste properly to reduce the spread of norovirus. I’m not going to get norovirus *knocks on wood*. I’m going to be better about taking pictures related to things I want to discuss in future blog posts. I will be entering into Tennessee. I will hit the 200 mile mark in the Smokies. I will hit the highest point on the trail at Clingman’s Dome. Having a dog has thus far been no problem at all! It is undeniably some extra work but the reward of having a constant companion is worth it. Jetta is extremely well behaved, the best dog out there in my opinion, and if you ask just about anyone who has met her they will agree. I have found I have to be extra vigilant because many dog owners are far less responsible with their own canines who are not as well behaved. In one such situation Jetta did get in one unfortunate dog fight that could have been avoided. Luckily there was no serious damage. 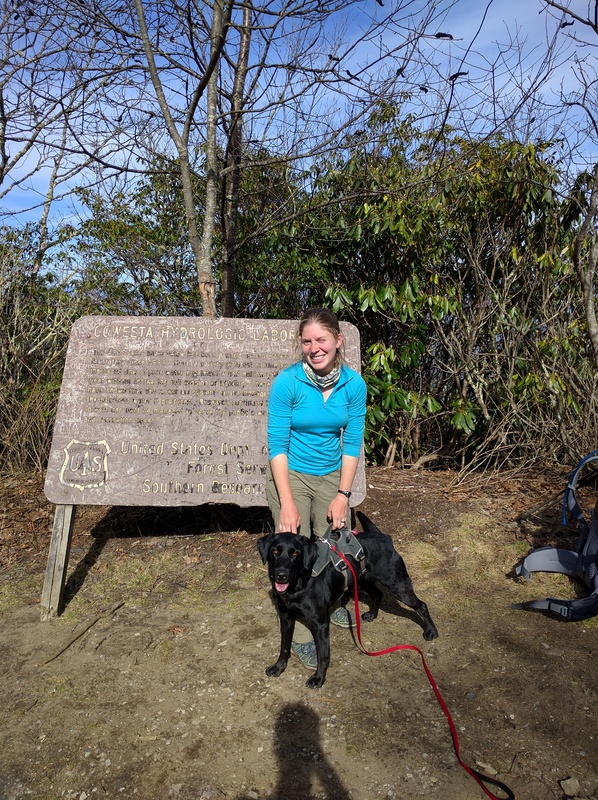 Just remember if you are going into the backcountry with your dog be prepared to be responsible for them and know that other owners may not be as responsible or just more ignorant. You may have to do a little extra work to keep yourself and your pup safe, and if you are ever uncomfortable in a situation with your dog be ready to say something to keep yourself and your dog safe. For example I have had to ask people to please not feed my dog and I have had to ask another owner to retrieve their unleashed dog from my dog’s space. Thus far everyone has been friendly in these situations. It sure is nice to have a happy dog to share this with. 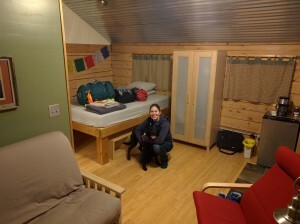 The Hiker Hostel Dahlonega GA: Dogs are allowed everywhere except the container cabins. 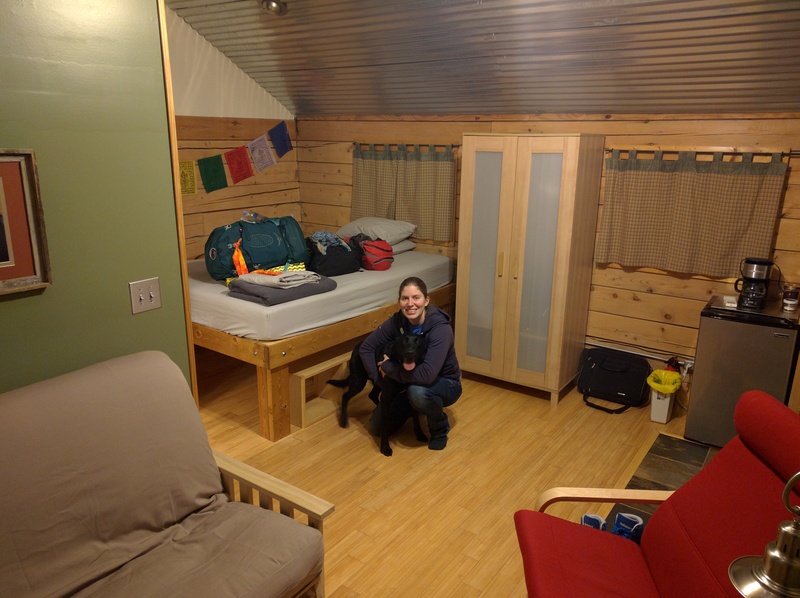 My husband and I had a private cabin and it has by far been the nicest hostel I have stayed in with the friendliest staff. It is up for sale but hopefully nothing changes with new ownership. Come on look how charming this place is! Awesome owners and super dog friendly. 5 stars! Top Of Georgia Hostel Hiawassee GA: Has a dog friendly bunk room with dog beds that Jetta loved. Dogs are not allowed in the other buildings including the main building where breakfast is served but staff was friendly and offered to watch Jetta while I went in for food, shower, resupply. Comfort Inn Franklin NC: They have the most comfortable beds, an indoor pool and laundry. They put us on the main floor next to the outside door for easy potty access. It was more expensive but I highly recommend this option regardless of whether you have a dog. It is right across from an Ingles and some restaurants. 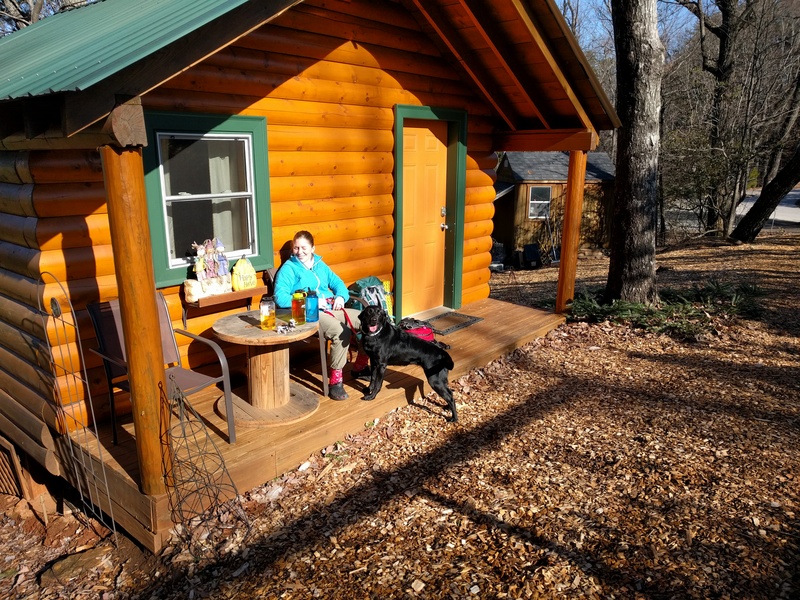 Nantahala Outdoor Center: Allows dogs in the outfitter and has dog friendly bunks. Very basic hostel but worth it for a shower and laundry. With all you have going on, thanks for the long call during your weekend respite! It was great to hear your voice. You’ve got this! Could you blog on Jetta’s equipment? How she is doing adapting to the terrain. Resupply for her as well as you. Her condition. Do dogs get hiker hunger sooner than people. Do you filter her water as well as yours? I usually skip the milk with my knorr but add cheese! It works out the same and gives you a nice creamy texture. I usually stir the milk in at the end. Extra calories, vitamin D & calcium. Good for the long haul. Thanks for all the info on dog hiking. Glad to see the emphasis on responsibility. Love happy dogs! Hang in there girl. Hope your knees get better. You might try Osteo Bi-Flex. two doctors I know use it for knee joint pain. Great info for dog owners! Jack and I start our 13 day section hike on the 3rd of April. How much food is your dog eating per day. I put smelly treats with a mix of dog food to ensure ge would eat well. Do you use bear vaults or hang etc. Great news about dog friendly neels gap and shuttles to franklin as these are my resupply points as well. Thanks for posting this! 13 days, where fo you think I will be as a guess as my girlfriend is curious? 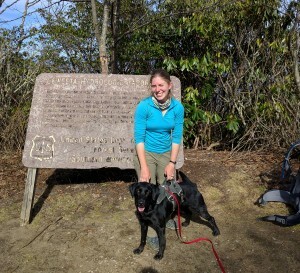 Do you hike with jetta on a leash? Curious what you use. I’m backpacking this summer with my pup. What size tent do you have? Thanks! Hey Sara, I enjoyed reading your blog! My son, Aaron “tea time” said Jetta was the best behaved dog he had ever met! Sorry to hear she got in a fight! I hope you continue to enjoy your adventure.